Current Lead Time: Most orders are made and ship within 3 to 5 working days. 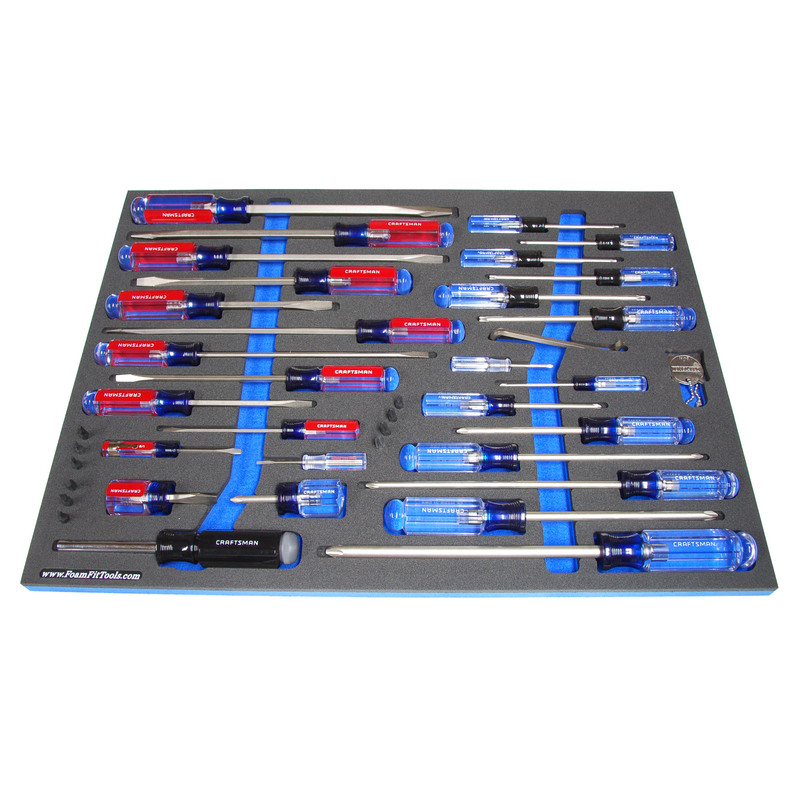 Organize your toolbox using durable foam inserts CNC-cut to shadow your tools. Don't waste time looking for your tools. Bright, contrasting colors show what's missing in a glance. Tool-shaped spaces allow anyone to put tools back; even someone who didn't get them out. Large finger pockets and just enough clearance to pick tools easily. A great way to 5S your toolbox (sort, set in order, shine, standardize, sustain). Our goal with every design is to eliminate searching. You should be able to reach for a tool, knowing where it will be with just a quick glance as the drawer opens. FoamFit Tools does things differently. We offer high-quality tool foam blanks for making your own organizers. We also have a selection of organizers designed for popular tool sets. These organizers can be customized if needed. We provide drawings of our organizers so you can be confident before placing an order. We list our prices so you can make informed decisions without having to wait for a quote, and we produce standard designs to save you money. Choose from over 300 preconfigured tool organizers, or give us a call to start getting more done with your tools today. 4 new organizers have been added for Wright combination wrenches. These high-end wrenches have a thicker profile to feel better where they hit the palm of your hand. The wrenches are forged by Wright Tool in Barberton, OH. 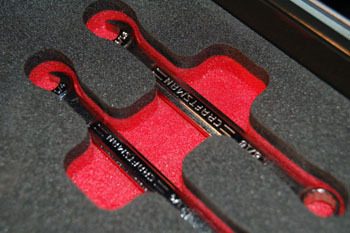 2 new organizers have been added for Snap-on Instinct screwdrivers. 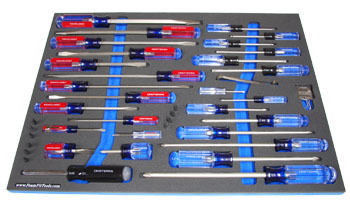 F-02848-R fits slotted screwdrivers plus a ratcheting screwdriver set. F-02849-R fits Phillips and Torx screwdrivers. 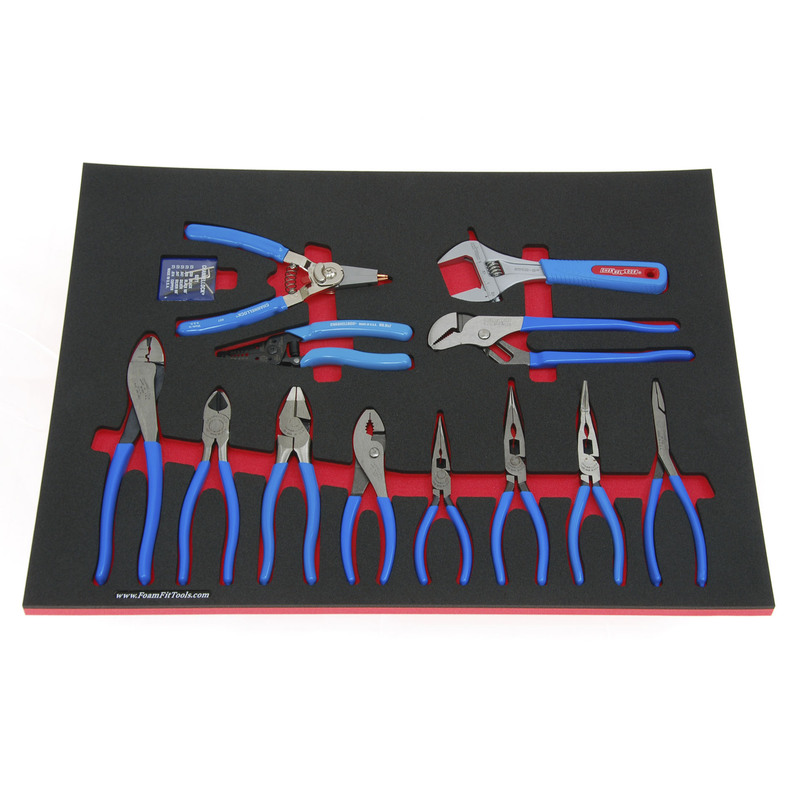 2 new organizers have been added for Channellock pliers. F-02842-R can be trimmed to fit smaller drawers. F-02841-R has two updated pliers and also adds a wide adjustable wrench. 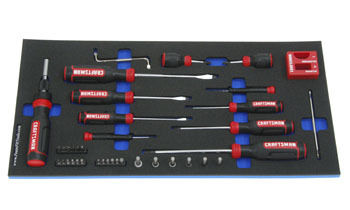 A new organizer has been added for Craftsman soft-handle screwdrivers. These new Craftsman screwdrivers are sold at Lowes. Also available as a kit with the tools. 3 new organizers have been added for Craftsman gunmetal chrome wrenches. These new and improved combination wrenches are sold at Lowes, but you can also order them in our kits with tools section. 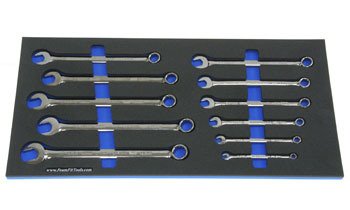 A new organizer has been added for Wright full polish wrenches. It fits both inch and metric wrenches, and is also available as a kit with the tools. 3 new kits have been added for Craftsman hammers. Kit 131 and Kit 132 include 5 hammers, 1 pry bar, and 6 Mayhew punches. Kit 133 includes 4 hammers with 5 Mayhew punches. 2 new kits have been added for Craftsman ratchets. 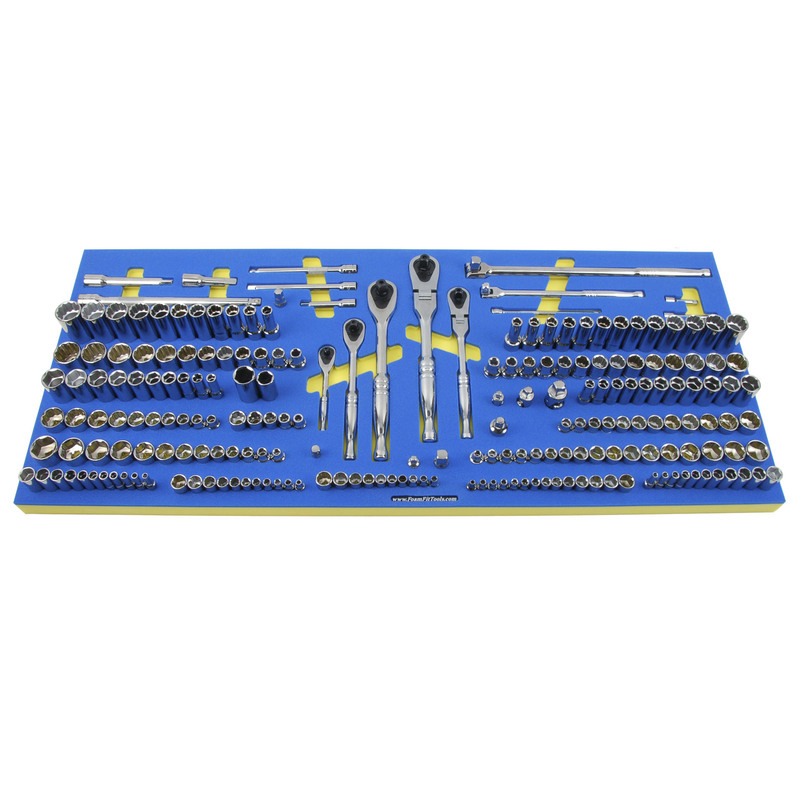 Kit 129 includes 39 bit sockets, 3 ratchets, 1 breaker bar, and 14 other tools. Kit 130 also includes 2 flex-head ratchets. 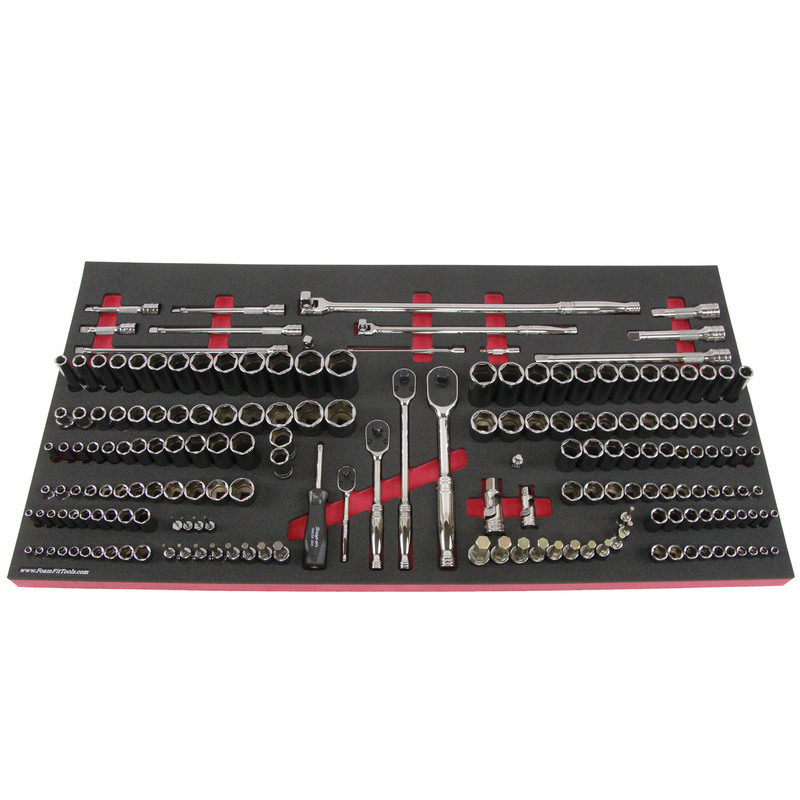 A new organizer has been added for the Craftsman 81-pc gunmetal chrome mechanics tool set. It fits in a small toolbox drawer and makes the tools easy to remove. SPECIAL SALE on kits that include Craftsman reversible ratcheting wrenches. Save $65.09 on kit 123 or $93.09 if you buy 2 or more. Save $96.09 on kit 124 or $124.09 if you buy 2 or more! 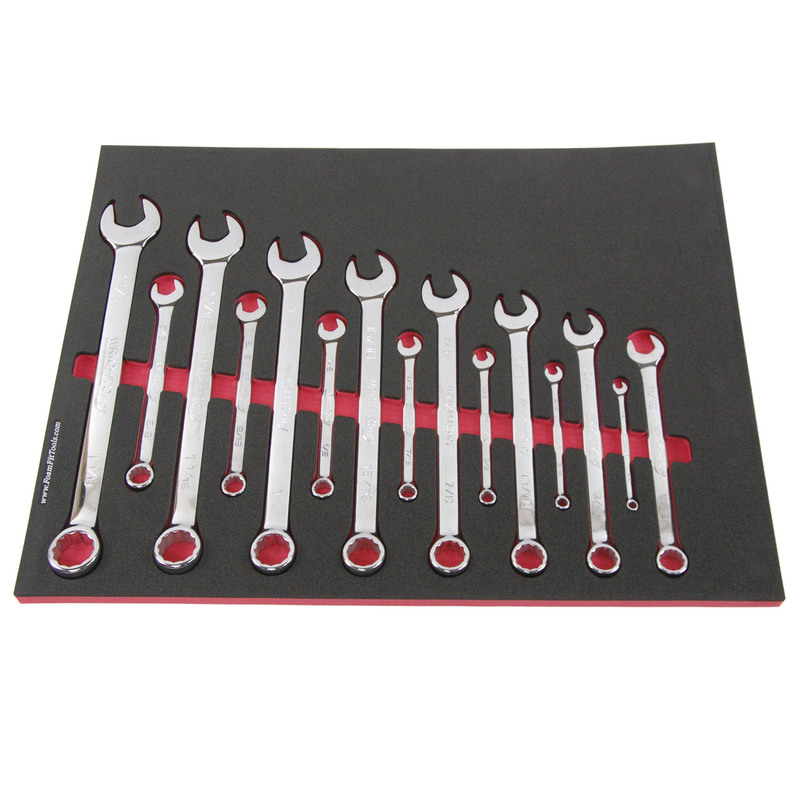 2 new kits have been added for Craftsman full polish wrenches. 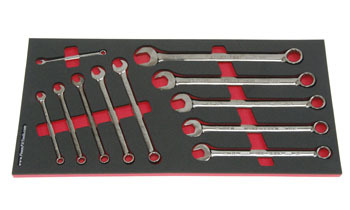 Kit 127 includes 16 inch and 16 metric wrenches. Kit 128 comes with the same wrenches, but is sized to fit a larger drawer. 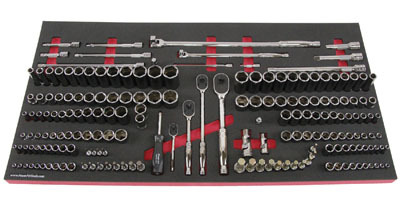 2 new organizers have been added for the Craftsman 176-pc socket set. These inserts were designed to fit the new, non-USA sockets. 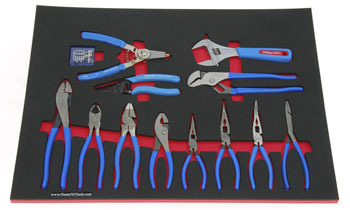 3 new organizers have been added for Craftsman TruGrip style pliers. 3 new organizers have been added for Husky screwdriver sets. 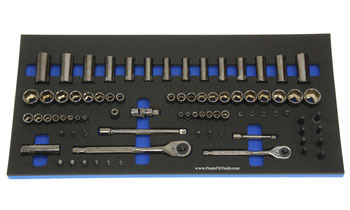 42 new organizers have been added for the Husky 432-pc mechanics tool set. Check out our new video discussing tool organizer options for the Craftsman 299-pc Ultimate Socket Set. Stanley Black & Decker acquired Craftsman in 2017. In 2018, the Craftsman brand started launching new tools which are sold at Lowe's Home Improvement, Ace Hardware, and other retailers. Tell what's missing at a glance. Anyone can put tools away in the correct place. Prevent tools from rolling and sliding when a drawer is closed. Protect expensive tools from damage. Show customers the pride you take in your work. Save time - let us do the cutting. Save money with our competitive pricing. "Just had to let you guys know that I think these socket trays are amazing! I have used all kinds of rails and trays and these are the best. Fit and finish is perfect." 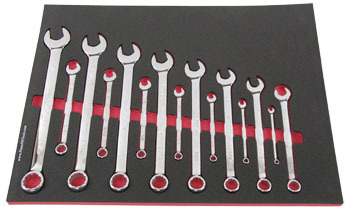 "Just got the wrench organizer. One word, AWESOME! Just what I wanted!" "I have to say that I am quite pleased with your product. I can see a lot of time was spent on choosing the right materials and making the cutouts fit." "Thanks again for all your hard work and actually listening to what I wanted. FoamFit Tools ROCKS!"